This is an interface scheme for R11 and R11.5 (might work with earlier versions as well). Layers get one of 8 different symbols when you create a new layer. At the time of this writing, you can’t select which color and symbol you get when you create a new layer, so just create a couple of layers and throw away the colors/layers that you don’t like. KilibeeRadical only: Dimming of viewport controls to remind you that you can save valuable time by controlling the viewport with alt-MouseDrags! 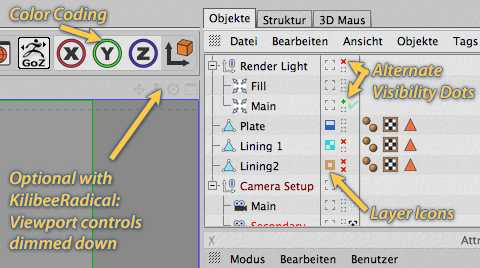 Start Cinema 4D, invoke the application preferences and select the Kilibee or Kilibee Radical scheme there. The path is in resource/schemes NOT library. Yes, many people install schemes in the Application/resource/schemes folder. This works fine as long as you are administrator on your machine. However, it’s not recommended practice, as preferences and user files should not be put in the app directory, but in the user preferences directory. If you don’t know where your Pref directory is located, search for “default.lib4d”, which resides in its /library/browser subfolder. BTW: The same is also true for scripts or the content browser. Hi, will this work on R12 too? Thanks!